...as well as camera/DVR add-ons to existing systems—digital or analog. This includes expanding/upgrading existing traditional analog systems to achieve IP-like quality with simpler—and much less expensive—HQA upgrades. You can buy security cameras anywhere. But to have a truly functional, robust surveillance/recording/monitoring system for your business/office in Chicago, you need system design, installation, programming, and integration with your data network from someone who truly understands both. Don't get sucked into contracting services from a "camera installer" for whom IT networks are just a sideline or vice versa. For decades, Andromeda has served the IT/Security needs of small-to-medium sized businesses/organizations like yours in the greater Chicagoland IL/Indy area. We have cultivated expertise in both the camera/access control/alarm/communication "arms and legs" as well as the data network "brains" of office systems and have years of experience integrating these together for a diverse cross-section of businesses, municipalities, and other associations/organizations. Andromeda lives to serve organizations like yours near Chicago—at your level of need, your timetable, ...your budget! Ask Us About New Cloud-based DVR Recording Integration! 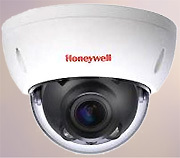 Your timing for creating or expanding a current camera surveillance system could not be better. There is no longer a need for an expensive, dedicated system to monitor your premises. We also provide great options for expanding an older camera network with better/newer analog and digital technology without scrapping what you might already have! By leveraging your existing IT network for your security system(s), Andromeda can save you time, money, and lots of headaches with efficient integrated systems that can do more than you probably imagined: real-time alerts, automated responses, and more. We are a certified Panasonic Network Camera Installer. We utilize the latest in IP Video Camera technology, which allows the cameras, DVR recording and viewing all to be performed on your existing computer data network. This allows you to use your existing investment in your data wiring and data systems and extend that network into the security camera/webcam arena. Please contact us or fill out a New Contact form on this page to have an Account Manager contact you regarding the many ways we can assist you with your IT/computer networking needs. 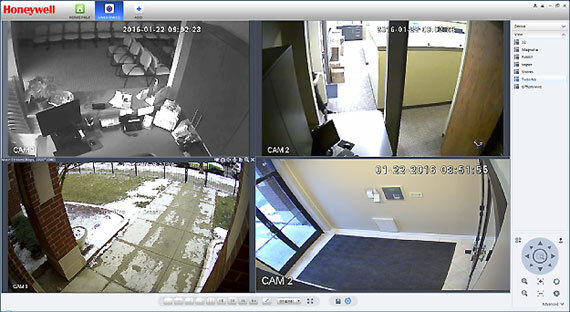 The ability to record and later playback is an important and necessary part of any video security system as is the ease of monitoring and being alerted when activity is detected. There are many options available; from on-camera memory sticks to a full-blown, searchable recording system capable of storing months worth of video from all your cameras. The viewing software is very user-friendly and easy to use. Andromeda Technology Solutions will work to understand all your needs and provide a solution that exactly fits those needs, and allows for future growth if necessary. Our attention to detail will ensure you receive a system that you will be 100% happy with. You can start with just a few cameras and expand the system as you grow. It is very easy to add cameras to the system, without throwing away any of your initial investment. There are options to synchronize recordings with your POS receipts, so you can exactly match the video recording with an individual receipt transaction. The wide variety of camera types and camera options make the system extremely flexible to fit almost any application. If you are looking to add a security camera system to your technology mix, here is a simple and overriding factor that you shouldn't ignore. Like many things in life, you get what you pay for and CCTV cameras are no exception. There is a vast difference in a $59 security camera purchased from Costco or Amazon, and a professional grade, $300 camera. The differences show up in picture quality, reliability, and longevity. How To Tell If A Security Camera System is Right Choice? Imagine the unimaginable. A break-in occurs at our business. You did everything you could to prevent this (i.e. a functional burglar system, cameras and even access control at specific entrances). Now, you go to look at footage the security camera caught so you can catch the culprit and the image shows a grainy blob. Now, imagine poor quality mixed with weather or poor lighting...you get the picture (or lack thereof). Fast forward a few months after you install your system. Two employees get into a fender bender in the parking lot. When the police/employees request footage of the incident you don't sweat it. You head directly to your DVR and prepare to play back footage...but wait...looks like your system is malfunctioning and a quarter of your cameras within your security camera system haven't been recording like you thought they were. Bummer! When spending money on technology, it is important to see it as an investment. Sure, things come and go but investing in a quality system from a reputable vendor ensures that your system will last. Systems installed by professionals typically last years with proper maintenance and system care. That system on sale at Costco is lucky to last you a few months over warranty without some sort of failure. The one constant with cameras: they need to work. They need to capture what you need; whether that be a parking lot, office space, warehouse or any other number of critical areas in your facility. If you cut corners here, you'll get cut corner results. We'd suggest instead, invest that money into a quality security camera system for your Chicago-area business that will perform when you need it and for years to come. The post "What To Consider When Buying That Security Camera System (Hint, It Isn't Price)" appeared first on Andromeda Technology Solutions. Would you be OK with a criminal or competitor watching you and your office via your own CCTV security cameras? Security and camera systems, like many other technologies, are becoming more and more integrated within IT networks and infrastructure. This is great for ease of use, capabilities and increased protections. However, it can also open up additional avenues and risks for your company if managed incorrectly. Imagine all the information someone could snag with limited access to your CCTV system. You wouldn't trust your IT to "some guy" (at least we hope not). You should give the same respect to your security systems. It may be a good idea to buy a system from Costco or Amazon. But those off brand systems are easily hacked and they may carry pre-installed malware. Just last year a slew of security camera systems purchased on Amazon were found to be infected and could be hijacked by hackers to access data and camera footage illegally. In almost all cases, some part of your security camera system needs an IT professional involved to finish the job and configured correctly. You can either trust the camera guy as he fumbles his way around your network, potentially leaving easily accessed holes in your protection, or try to get the security camera guy and your IT guy to coordinate and work together (what we call a scheduling nightmare). Or, you can hire a professional technology services firm that does both. 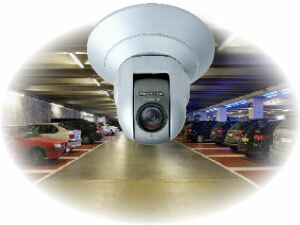 Why Chose an Andromeda Security Camera System? Andromeda understands the intricate relationships security technologies have with your IT. We have specialized technicians in each area. They work together with a vast understanding of the security that both your CCTV system and your network need. Also, because we sell only professional grade hardware and software (Honeywell) the chance of a hack on these pieces is much less than the cheaper no-name brands. Security threats are everywhere these days. You don't need to make yourself more vulnerable. Do not create a gaping hole in your enterprise via the very thing that is there to help protect you. Reach out to our team today if you are considering any security projects. We ensure that the solution you choose is right for your business needs, but most importantly, we make sure it is installed correctly and you are protected. The post "Why Good Camera Systems Need Great IT Pros" appeared first on Andromeda Technology Solutions. We have cameras and recording solutions for every possible application. Utilize your existing network investment to incorporate your video security needs. Over 20 camera types make the system very flexible and adaptable. Systems are easily expandable from one to 50 or more cameras.